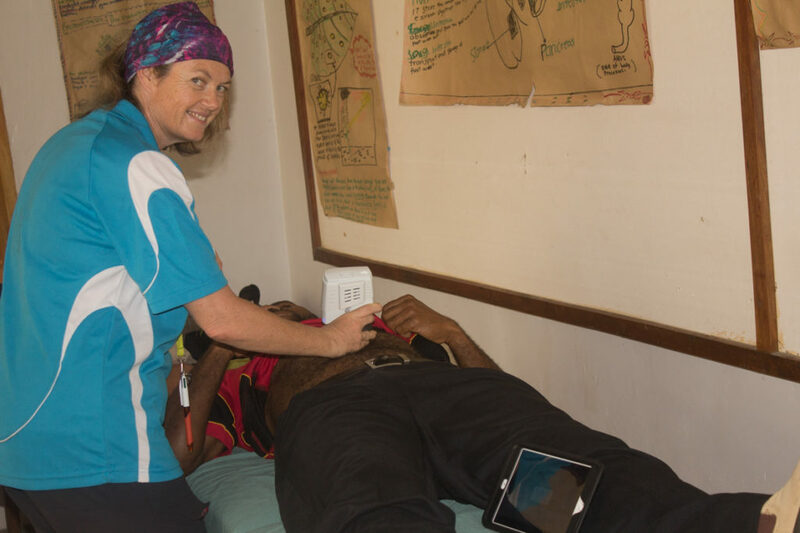 Sharyn Moodie is a qualified Australian ultrasonographer (ASAR) who is spending her time travelling rural Australia to offer her medical expertise to those in need. 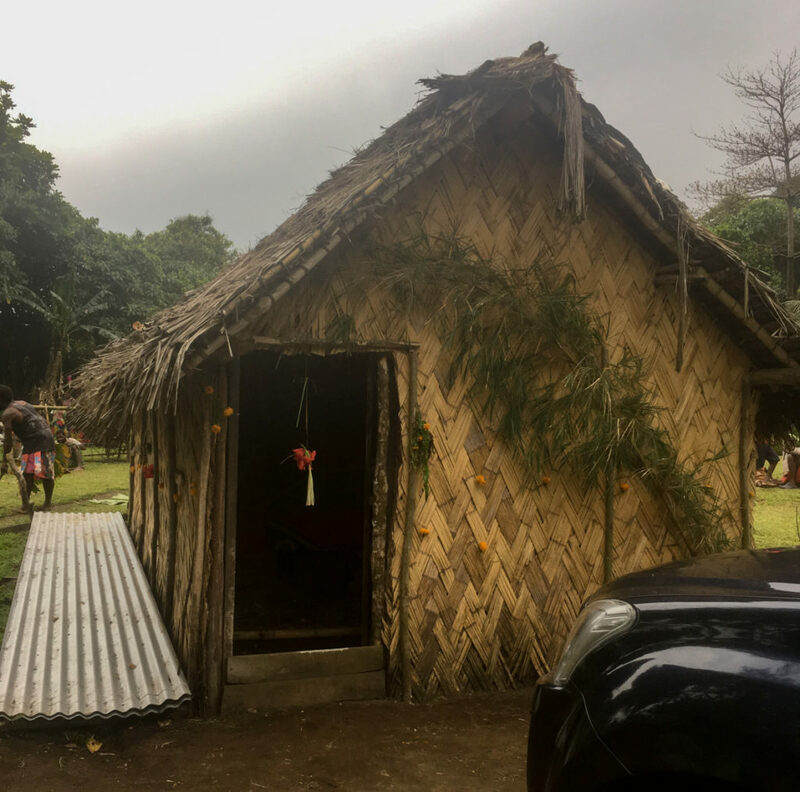 Along with the Bridging Health organization, Sharyn travelled to Tanna Island for two weeks in October 2018. Her A Sound Adventure blog covers what it has been like on the road as a travelling sonographer. 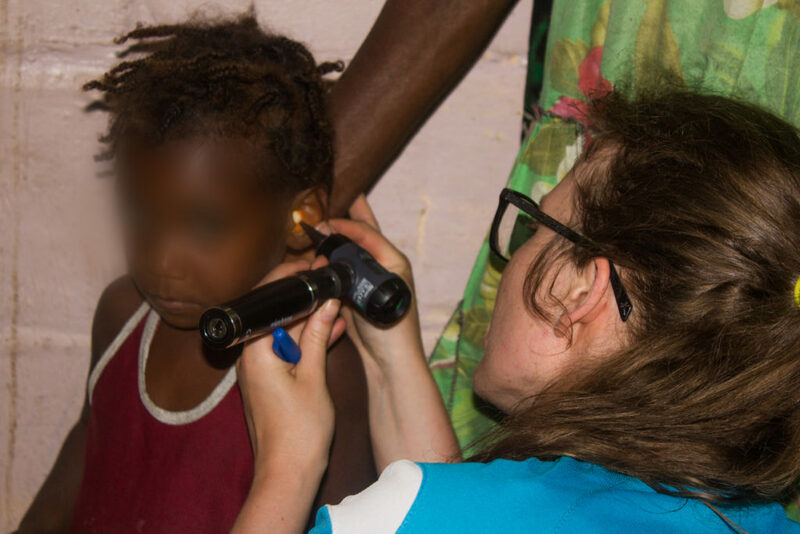 The words ‘working holiday’ do little to encompass the broad range of experiences, challenges, and emotions I experienced as the sonographer on this year’s Bridging Health trip to Vanuatu. The Pacific island republic has only a handful of sonos at hospitals spread across its 83 islands. And in a land of few cars, poor roads and limited communications, it is not easy to get to one of those. 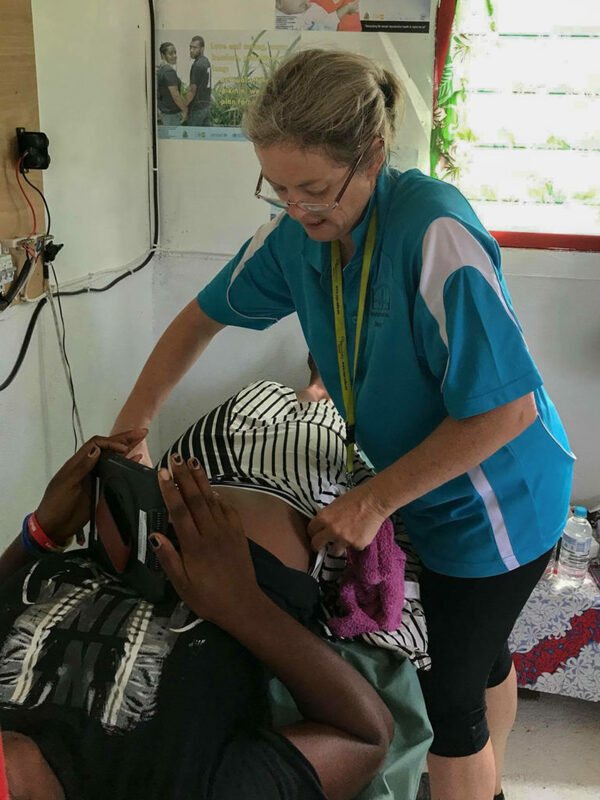 I grabbed the opportunity to head to one of the southern-most islands, Tanna, with a portable ultrasound system lent out by Clarius. A shelf in a hut (complete with rake) was one of the most challenging environments I scanned in. Getting there involved a 45-minute drive over rough roads in a 4WD. 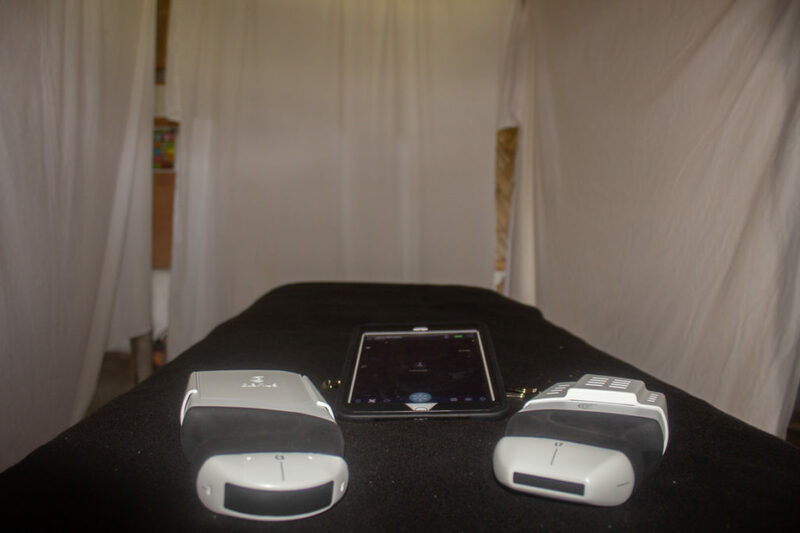 An i-pad and a Clarius ultrasound scanner rest on the bed ready to start work. Bridging Health is a small group of people based in Rockhampton, Central Queensland, Australia. 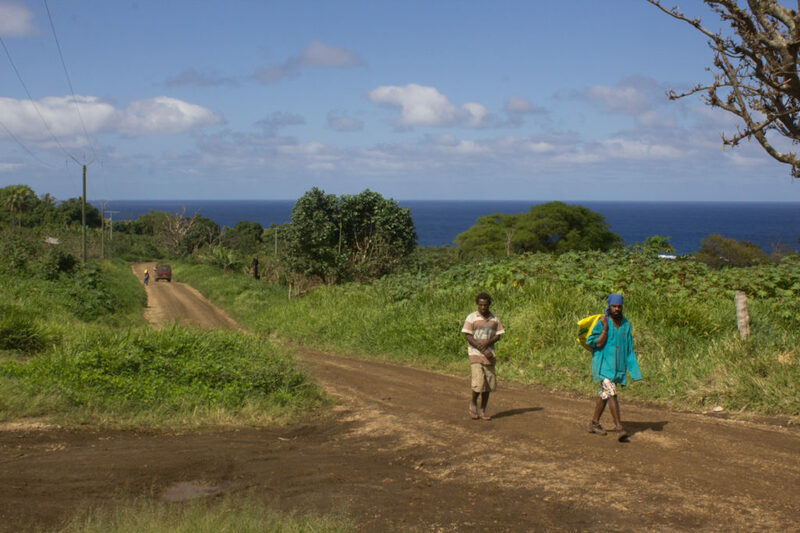 It heads to Tanna Island, Vanuatu, twice a year, because of a special link with the island – some of their ancestors were taken from there to Queensland in the late 1800s to work on sugar cane fields. 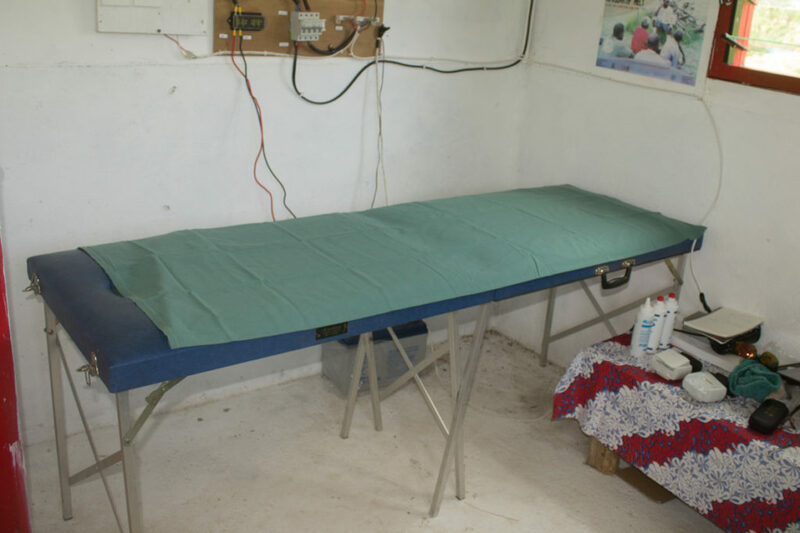 The island hospital, Lenakel, has one emergency bed, one surgical bed, and little modern equipment. Its imaging department consists of one technician, who is kept extremely busy with x-rays and ultrasounds. 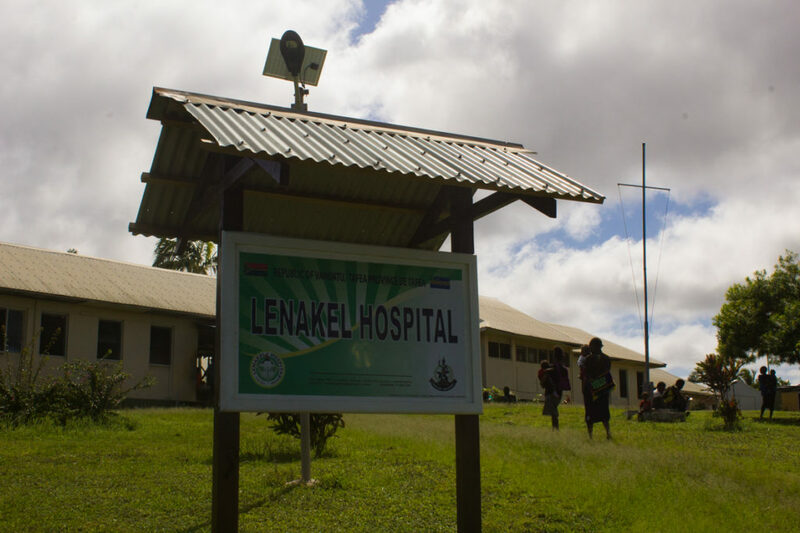 Lenakel Hospital was badly affected by Cyclone Pam in 2015, and continues to struggle to provide adequate services to an under-resourced Tanna Island. To get to the hospital involves a walk up a steep, rough hill. Lanakel Hospital’s radiographer and sonographer Shamina. But to get an ultrasound, a patient first has to get to Lenakal. 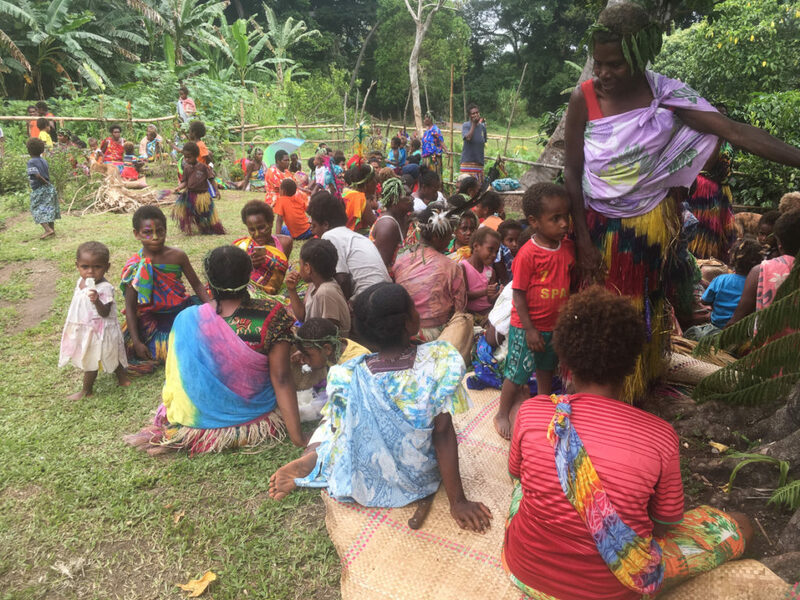 The Bridging Health group of 16 volunteers, including one doctor, several nurses and myself as the sonographer, visited six different remote villages over a week and a half. We held mobile health clinics, while other volunteers visited local schools and gave health and cooking education. The health clinics were held in various places – in village meeting places, in a dining room, in aid clinics and in a school classroom. I often scanned on a portable massage table which we brought with us, or on low aid clinic beds, the hygiene of which was questionable. Well, actually not questionable, more like non-existent. 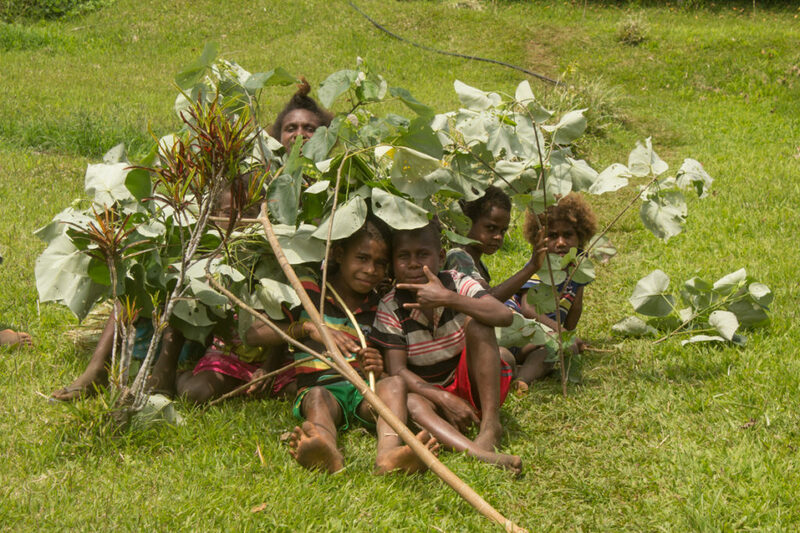 To get to these places, we travelled the way everyone does on Tanna, in the back of a ‘truk’ – or a ute, as us Aussies would say. We would pile our equipment into the middle of the tray, then squeeze in around it and hold on as we bumped over rough, dusty, steep roads to our destinations. This mode of travel means taking even a portable ‘lap-top style’ ultrasound machine on this trip would usually be difficult. 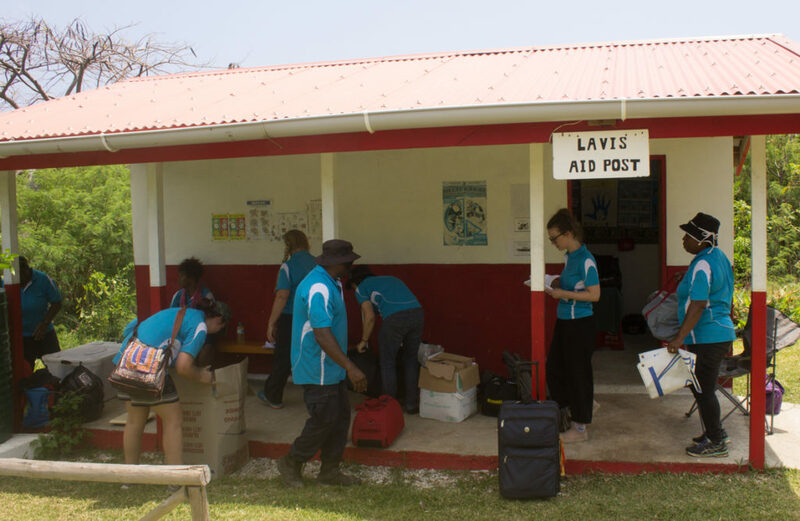 They usually weigh upwards of 10kg, and there is a 10kg limit on luggage on the 35-minute flight from Port Vila. I needed clothes and a toothbrush too! The Clarius came in a case weighing 5.5kg, but I was able to provide a secure travelling system that halved that. The system comprised of two ultrasound probes (one convex, one linear) , each with rechargeable batteries, and an i-pad. The probes sent information to the i-pad using their own wi-fi system, so they could be used absolutely anywhere. We worked on ‘island time’, as attempting to do anything else only ended in frustration. Organising transport, team food and working around which team members had gastro that day were all confounding factors. Most days though, we would end up pulling up to a clinic sometime in the morning, and sorting out where to set up a triage table and start our work. Sometimes villagers were already sitting around patiently waiting, other times there was no-one. But by the time we were set up, the crowd had gathered. The view outside my ultrasound room at one clinic. Thankfully they weren’t all waiting for me. Note, women and children waited in one area, and the men in another. In most places, the men presented themselves first. Patients came with specific problems, or for a general health check-up. Firstly they would have their details taken – sometimes just a first name, as not everyone had a last name and those over 40 mostly didn’t know their birth date. Then they would have temperature, heart rate, blood pressure and blood sugar taken. From here they would be diverted to education talks on safe lifting or healthy eating if they had no other problems. Diabetes and other non-communicable diseases are an increasing scourge. Or they would be sent to nurses for wound care, to our doctor, Joanna Keen from Kalgoorlie, Western Australia, or our midwife, Enneth Ilaisa. Two local nurses, Scott and Harvard, were part of the medical team too, and were invaluable for translating. After this process, if necessary, I would do an ultrasound. Because of the triaging process, I wasn’t as busy as I had expected. But still, I worked hard, under incredibly non-ergonomic conditions. My back was always sore after a few hours of twisting and bending to reach the necessary spots. Patients’ main complaints requiring ultrasound were musculoskeletal issues, wounds and gynaecological/obstetric. Infertility was a common complaint, and I had two pregnancy scan patients who turned out not to be pregnant. Apparently pseudopregnancies are common because of pressure to be pregnant in order to keep a partner. 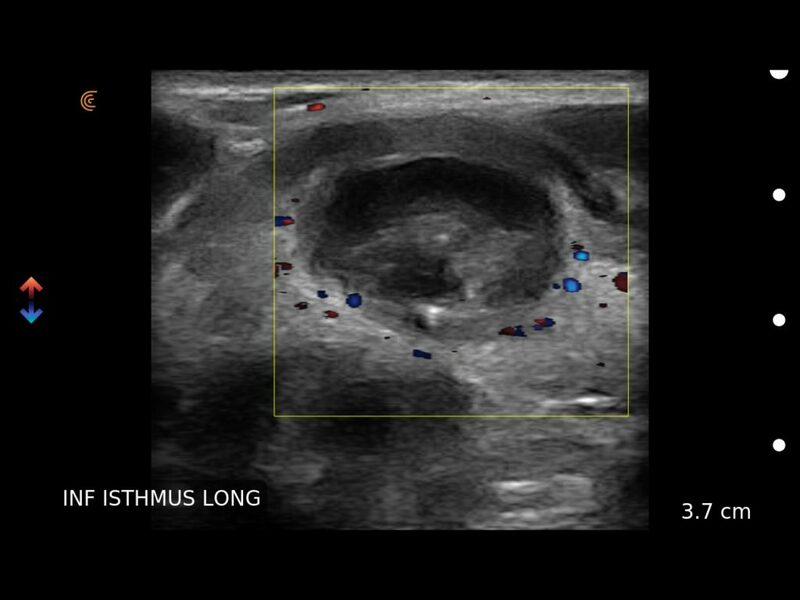 The most interesting scan involved a huge abdominal/pelvic tumour. It was previously known – our team had scanned the patient the year before when she was 14 weeks pregnant. The local hospital had been reticent to send her to Port Vila for further investigations. But by this year, it appeared she had been to the capital, delivered a healthy baby, and told to return in a year so they could address the tumour. Without access to patient records and speaking through translators, it was difficult to work out any patient histories. Had this tumour been biopsied, did anyone know what it was or where it originated? It was too big to measure accurately with ultrasound, although I could determine it was 19cm deep and took up most of her pelvic cavity. All we could do we write her another referral to Lenakal hospital and hope she made it there. Even if benign (as it appeared), it was squashing her other organs and could not have been comfortable. One ‘fun’ case for me was a young man who had been in a fight and had a very swollen hand. Quite rightly too, his fifth metatarsal bone was snapped in half. Not fascinating pathology, but good for a sonography diagnosis when there was no x-ray available. The patient wasn’t too concerned, and did not even want a cast put on. There was also a thyroid mass causing swallowing discomfort which was not obvious by physical examination, and a para-umbilical hernia which initially felt like a lipoma. 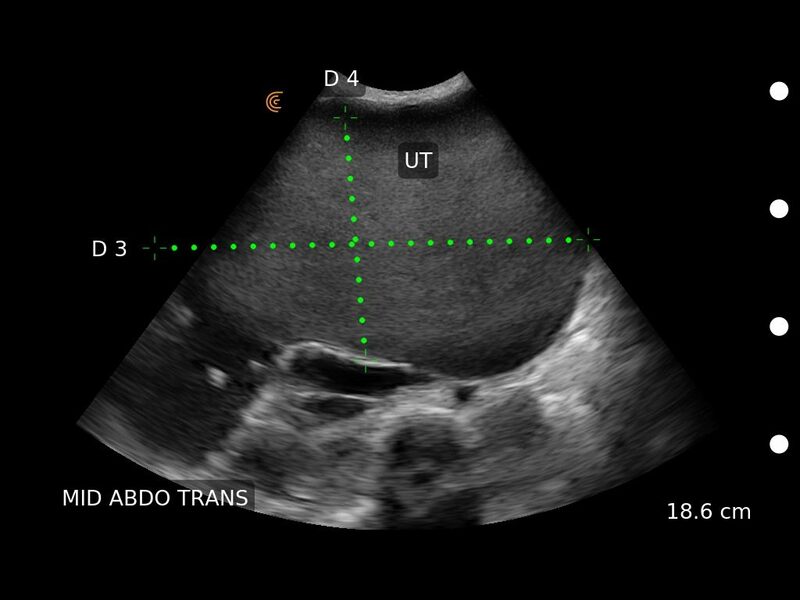 The ability to use ultrasound meant more accurate information was available for those patients. 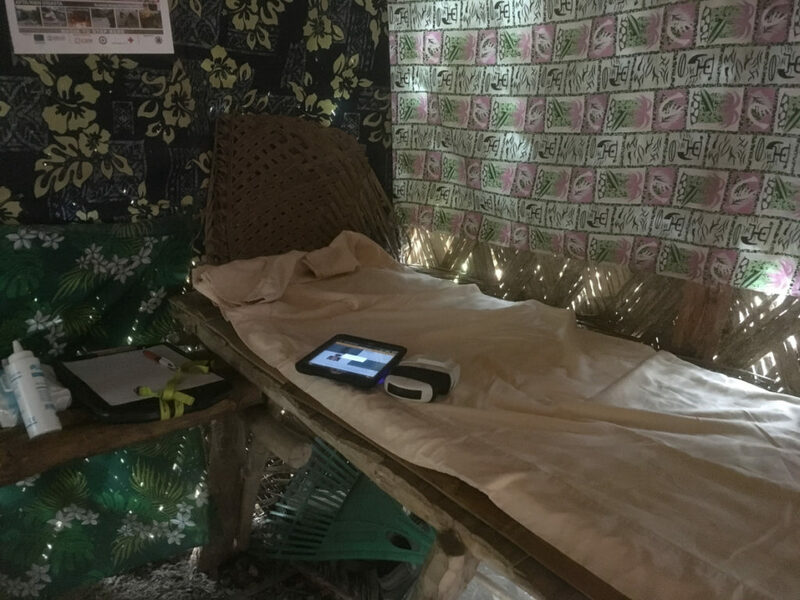 The Clarius system was also invaluable outside of clinics, as several times we used it to scan patients who hadn’t come to clinics, but were identified as our members chatted with locals or accommodation staff. 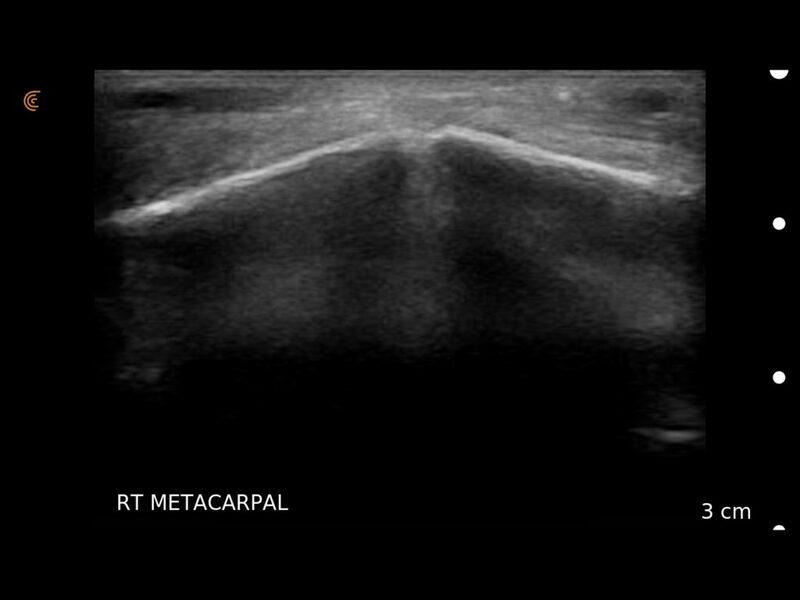 An ultrasound highlight was going to a male patient’s home. He had been bedridden for more than a year, due to back pain. Doctor Keen, a nurse and a local helper made our way through the fading daylight, heading to his small home. We found the man lying in a double bed, his wife cross-legged on the bed behind him. He said he had hurt his back quite a while ago, and the pain made it difficult to move. Dr Keen’s investigation and questioning showed it was probably nothing more serious than arthritis and some muscular pain, but he had some serious muscle-wastage. So he was advised to start moving around to try to rebuild his muscle, and given some painkillers. Then we found a strange mass on his shoulder, and another on his left kidney. Both were previously known, but he hadn’t done anything about them due to, well, having been in bed for such a long time. He only lived about three kilometres from the hospital. The Clarius system was like the members of our team- versatile, friendly and hard-working. The two batteries supplied (one for each probe) were reliable and lasted well. I didn’t run out of battery at any stage, and was able to recharge easily each night at our accommodation. The fans in the probes worked overtime to keep the expensive equipment running, as we sometimes worked in hot rooms with no overhead fans. But they didn’t overheat. I loved the freedom of working without cords, and the system was easy to use and intuitive. Many thanks to Clarius for allowing us to take the system and use it to provide such an important service. Thank you Sharyn for your global health efforts! 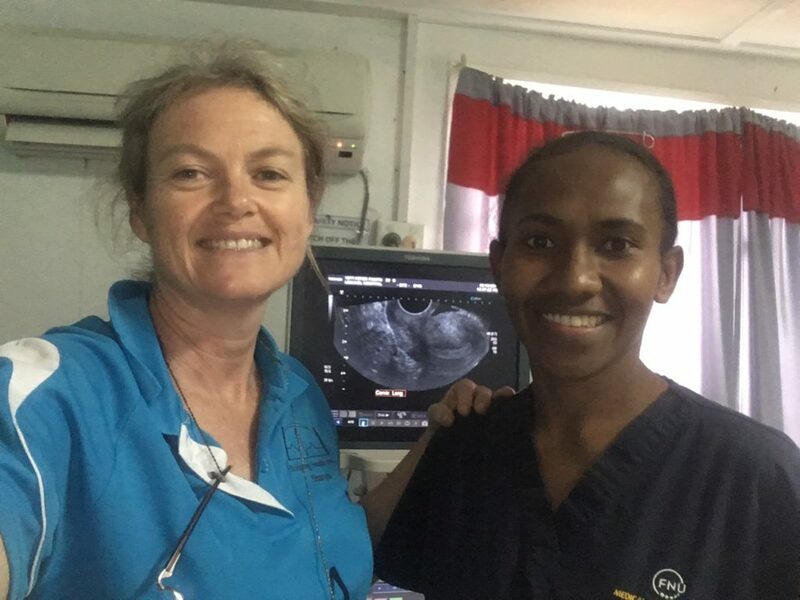 For more information you can visit Sharyn’s blog A Sound Adventure which covers her life on the road as a travelling sonographer or you can view more of her shared cases on our Clarius Cases platform.